Locksmith Near Me St. Louis: Smart Locks, the Smart Choice? When people search “locksmith near me,” one of questions we get asked most frequently is how to improve home security. It makes sense; our homes are where we keep the things most meaningful to us and, when everyone is home at least, our homes are how we protect our closest family. Needless to say, home security is a pretty high concern for nearly everyone. Lately, with the improvements and advancements of technology, there are a lot of high-tech ways to help improve your home’s security. The big question is: are they really as secure as their manufacturers claim? First, we need to clarify, because there are different types of smart locks, and different benefits and risks for each. When we refer to smart locks, we are broadly talking about any keyless or virtually connected locks. Modern smart lock options include bluetooth-enabled locks, keyless entry systems, and internet or smartphone app controlled options. The common denominator for all smart locks is that they seem like they would fit in perfectly in the Jetsons’ futuristic home—and they all ditch the traditional physical key. Most bluetooth-controlled locks were designed to replace the standard deadbolt lock and do away with any external keypad or lock mechanism. Instead, the deadbolt is powered internally by an electronic hub that you can control with a smartphone with the bluetooth function turned on. This article from CNET.com discusses the details of hacking a bluetooth lock, but the gist is this: a tech-savvy burglar can find free or inexpensive digital tools that allow them to bypass the security measures or find a backdoor key code that allows them entry. And, in terms of break-ins, the problem is that there won’t be any visible signs of forced entry, only a digital trail to follow. Similar to bluetooth-controlled locks, internet-connected locks also replace the traditional deadbolt and can be controlled by a smartphone app. The difference is, internet-connected smart locks offer a bit more security because the system can constantly update the list of “blacklisted” or false key codes. This creates another layer of security, as the system will constantly update with new information, but they aren’t entirely hack-proof. On the positive side, they also do away with the traditional keypad or external key hole, so they are harder to pick, but they are still hackable from a tech-savvy burglar. In addition, some systems have a built in security camera, which can boost the security. To learn more, try this article from gizmodo.com. 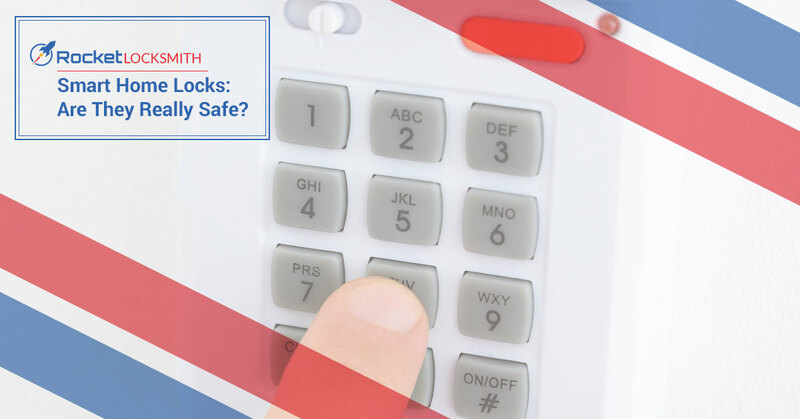 When we refer to keyless entry systems, or keyless deadbolts, we’re talking about the subset of deadbolt replacement locks that are opened by a keypad and a pre-programmed code. These are electronically powered and can connect via wi-fi, but they don’t rely on a smartphone app to unlock, so the security there is a bit different. Instead, these systems require the owner to program in a key code (or multiple codes) to open the lock. The benefit to this style of smart lock is that you can get instant notifications via text message or email any time the lock is disengaged, and you can see which code was used. This way, you’ll have nearly instant information about your home’s locks. Unfortunately, these systems aren’t entirely secure either, but they tend to be harder to hack than bluetooth or strictly internet-connected options. Locksmiths are, as our title implies, extraordinarily knowledgeable about locks and home security. If you’re looking for ways to improve your home security, give us a call today! We can help with everything from ensuring your standard deadbolts were properly installed to helping you choose and install high-tech locks for your home. Contact Rocket Locksmith today to schedule your home security improvement appointment in St. Louis!